Although up-stream Shotgun Nymphing will produce trout anywhere along DePuy's all through year, I usually carry one more type of "shotgun". It was because of infamous Southern or Southwestern winds in Paradise Valley. I again use the Middle Section of DePuy's as a case study for the "classroom of fly-fishing". The Middle Section flows like US Hwy 89 North-bound. So casting up-stream means one is facing and casting against winds. As a Livingston resident, I don't complain (or whine) over the winds. As an angler I can handle wind most of the time. One trick I apply all the time is to increase my casting-stroke, which is basically sending more power into my system (line-leader-flies) by adding extra speed and momentum to my regular casting form. Yet, I still have hard times every now and then. Oftentimes, gusts simply crush my leader-tippet before straightening = bad tangles. Also when I respond to my indicator and set hooks but actually it would be touching bottoms or snagging weeds, the split-shot(s) and bead-head nymph(s) would be flying toward my face. It can be very dangerous! So I simply had to adjust up-stream Shotgun Nymphing into some forms that can get along well with or combat against winds. 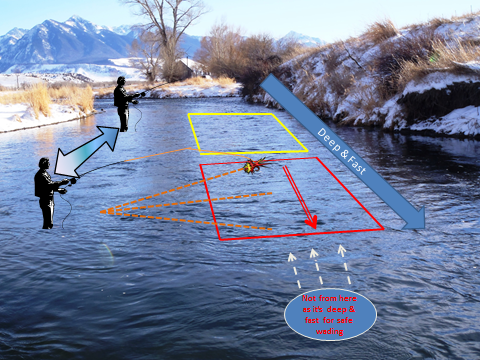 I still fish a grid at a time and want to target "chutes" between weed-beds and tightly along cutbanks. 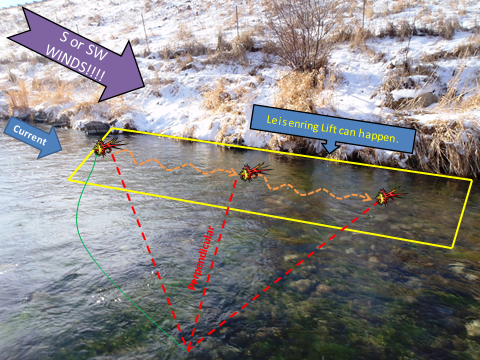 This time I cast with an angle = up-&-cross stream. That way, my line-leader-flies don't receive full-force of gusts. From there, I let my flies bounce the bottom and float downstream perpendicular to me and even below. When my indicator darts up-stream, I set the hook. If it would be trout as I wish, the battle is on. But if it happens to be due to the bottom or weed, the risk of the split-shot(s) and bead-head nymph(s) flying toward my face would be reduced as every move is conducted on the side of my body. Oftentimes, I have hook-ups when my indicator is perpendicular to me or even below from where I am standing. This is because my flies are causing the "Leisenring Lift" at the very end of drift. Typical weather condition while fishing at Middle Section. I still assign the grids and fish one by one. 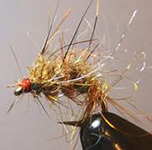 Idea of bouncing nymphs toward trout is the same. But I modify angle of casting from straight-up to up-&-cross. Modified Shotgun Nymphing for narrow grids along cutbanks or chutes among weed-beds. Every motion is conducted on one side of body. Besides windy conditions there are situations when I apply Modified Shotgunning. 1) Where I have to wade in for up-stream cast is somewhat too deep for safe wading. In this case, I stand on the shallower side and conduct Modified Shotgunning. 2) At Middles Section, during the winter, the sun angles cause tough reflections on surface pretty much all day. When it's hard for me to see my indicator, I adjust my positions and angles of casting from straight up-stream. 3) When I suddenly spot trout on my side. 4) When I suddenly spot trout ahead of me with angles (e.g., 45 on left, 60 on right). In these two latter situations, if I try to walk and position myself right below them, my movement may spook them. It can happen when trout haven't responded to straight up-stream cast or maybe because I haven't worked hard enough for that grid. Or simply due to reflection, angles of visions, or ripples caused by winds, I haven't been able to detect them. Also, it happens when fishing along bends and corners. This is another super visual sight-nymph situation. One can get either solid hook-up or total disappointment. Example of positioning & grids at a deep spot. Examples of sight-fishing with Modified Shotgun Nymphing. Guess where in Middle Section next time you visit! 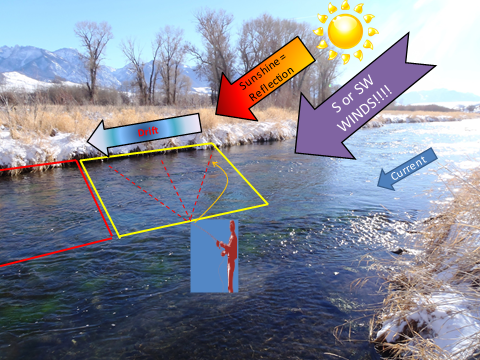 Whether PMD dun or aquatic worm, fly designing for spring creeks will never end. I can attest that showing new patterns to trout will increase catching rates. All of these are based on food sampling from my kick-seining or stomach-pumping. I tested many a time and these have been proven to catch trout consistently. I'd like to give some spotlights on aquatic food sources that are often underestimated too. How many snail patterns are out there? Do you know any anglers who fish for snail? Few, I guess. After pumping many stomachs, I couldn't ignore snails any more so I developed one. This one was the immediate success!! Trout do love snails!! This pattern will get you several steps ahead of other anglers who underestimate power of snails!! Like snails, how many anglers would fish particularly for crane fly larva? Some people even don't want to think about that huge thing….. But trout won't pass up when it's presented in front of them. This became another secret weapon of mine. EP Fiber can be substituted with other synthetic materials. I have found dark olive and tan are most effective at DePuy's. 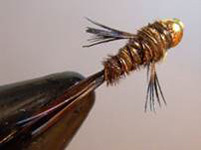 Probably the softest and most undulating damsel nymph in the market! Marabou, Aftershaft, & Chick-a-bou are integrated (hence the name MAC). 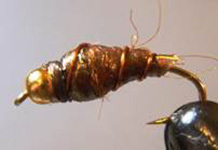 Gold wire adds some weight and protects soft fibers from trout's teeth. Damsel nymphs are most common in and around House Pond of DePuy's. They are also found slow deep spots along Armstrong's and Nelson's. Body: shaggy sparkle dubbing in dubbing loop – gray, tan, olive, & light olive are most common. Then consider orange and pink. BHB stands for "Bighorn" and "hot-bead". 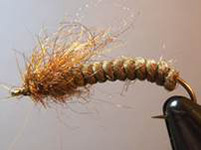 By just adding a bead, regular soft-hackle sowbug becomes more effective. 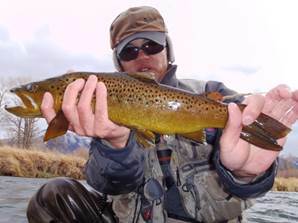 Tie extra amounts if you are planning to fish Bighorn after Livingston spring creeks! Effectiveness of this simple "dust ball" should not be underestimated. As it's easy to tie, better stock them a lot in different sizes and colors. Optional colors are orange and pink. This is the new generation of classic Beadhead PT. 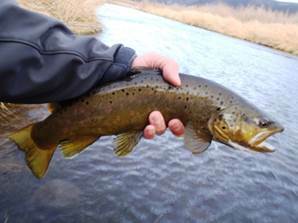 Extra-large tail and bulky body show different silhouette and tastes that trout have never experienced before. All sizes are important and effectively catching trout! Satoshi Yamamoto, http://leftyangler.blogspot.com, brought his passion for fly-fishing & fly-tying from Japan to Montana and became the first ever Japanese guide in Livingston, MT. He guides and fishes big rivers like Madison & Yellowstone, spring creeks in Paradise Valley, and various waters in Yellowstone Park. 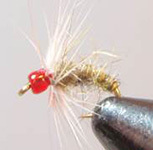 Hence, with his Regal Vise at the bench, his fly tying interests vary from tiny midges to 5-inch streamers and anything in between. Once his ideas are combined he goes out for experiments at those near-by waters. Satoshi submits his innovative patterns to Montana Fly Company (www.montanafly.com). 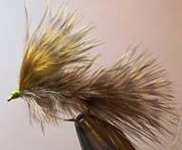 His own innovative original patterns can be purchased from his fly-shop, http://leftytyer.blogspot.com.